Are you trying to manage too many buildings using email? Our clients have won prestigious industry customer service awards our BixoService solution. Specialized knowledge base for facilities and property management. 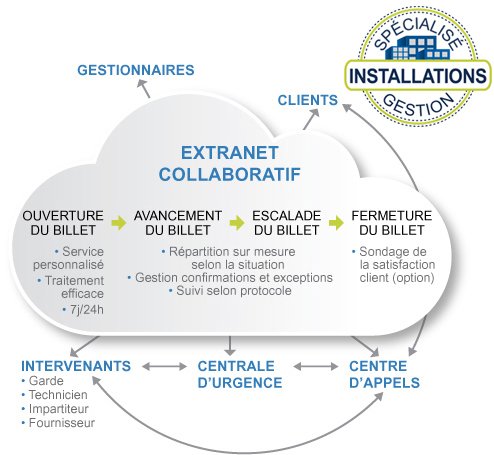 Cloud based solution with no software installation. What distinguishes the BixoService solution? Do you specialize in the management of facilities, real estate parks or real estate investment trusts (REITs)? That's good! We are the specialists for taking calls from your tenants to help you dispatch your teams on the spot quickly and efficiently. Our customers have won prestigious customer service awards using our BixoService solution. Designed specifically for the Facilities Management industry, our technology platform combined with our 24/7 call center agents allow you to manage all your tenant calls as well as service and repair requests and calls. emergencies, if any. You win to use our proven know-how! Centralize your tenants' service call requests and forward them to the right technician or support team is our strength. How do we get there? Through our knowledge base that matches service requests with the skills and availability of the stakeholders requested, by building or real estate group. Telephone answering dedicated at all times to the management of service tickets by installation or by group. Web management interface that requires no installation. Comprehensive and integrated management reports by building or by group. Confirmation of service tickets with follow-up on the progress of the work. Optional service: customer satisfaction survey. Rapid response to requests from your tenants - without exception! Reduction of repeated service calls for tracking pending jobs. Optimization of equipment utilization and site management. Simple and effective tracking of service requests. Instant sending of messages by the communication tools of your choice. Proper management of escalations and emergencies according to your business protocols. Improved support for your customers and increased satisfaction from them. This service is offered 24 hours/day, 365 days/year!